People stood up and cheered as Rubio was being challenged to tell him the truth. Rubio on the defensive on gun control. Student Cameron Kasky did not mince words. Sheriff Scott Israel of Broward County declared the U.S. has had enough of deadly shootings. Republican Sen. Marco Rubio was put on the defensive Wednesday by angry students, teachers and parents who are demanding stronger gun-control measures after the shooting rampage that claimed 17 lives at a Florida high school. 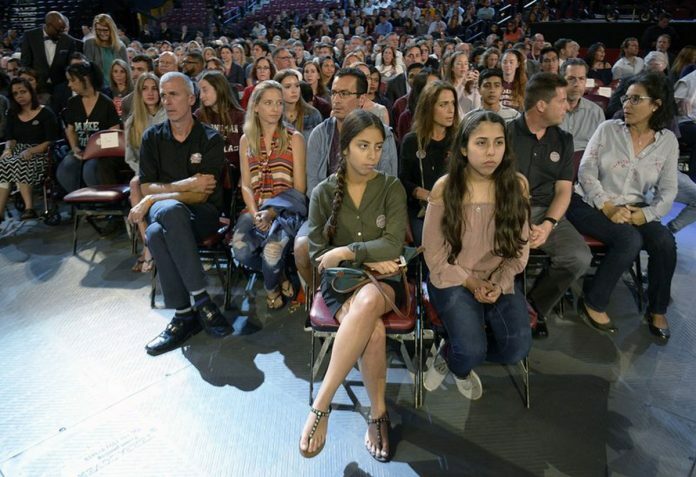 One of those confronting the Florida senator at a CNN’s “Stand Up” town hall Wednesday night was Fred Guttenberg, whose 14-year-old daughter Jaime was killed on Feb. 14 with 16 others. Rubio was the lone Republican at the nationally broadcast gathering after Florida’s GOP Gov. Rick Scott and President Donald Trump declined invitations to appear at the event in Sunrise, Florida. Rubio responded that the problems laid bare by the shooting rampage “cannot be solved by gun laws alone,” drawing jeering whistles from the crowd. Rubio responded that he would support laws barring those 18 and under from buying such weapons, support changing the background checks system and getting rid of bump stocks. Sen. Bill Nelson and Congressman Ted Deutch, both Democrats from Florida, also were present on a dais. Nelson said he grew up on a ranch and hunted all his life. “I still hunt with my son but an AK-47 and an AR-15 is not for hunting, it’s for killing,” said Nelson to applause. Ryan Schachter, whose brother Alex, was fatally gunned down at Stoneman Douglas High School in Parkland, Florida, was among those questioning the lawmakers. Student Cameron Kasky did not mince words telling Rubio, “It’s hard to look at you and not look down the barrel of an AR-15 and not look at Nikolas Cruz” before asking squarely, “Can you tell me right now that you will not accept a single donation from the NRA?” The room erupted in cheers as Rubio replied that people buy into his agenda and that he supports laws to keep guns out of the hands of deranged people. Survivor to Rubio: Will you reject NRA money? Shortly before the town hall event opened, the sheriff of the Florida county torn apart by the rampage spoke to the cheering audience, drawing them to their feet as he exhorted them to press on for stricter gun controls. Sheriff Scott Israel of Broward County declared the U.S. has had enough of deadly shootings and that he was personally saddened to have through the crime scene of a “horrific killer” 30 minutes after the attack last week. He said the young people should hold lawmakers accountable for making their schools and other community places safer or they won’t be re-elected.